• PLOT SUMMARY: Crisis on Infinite Earths crossover. Giant-size issue. 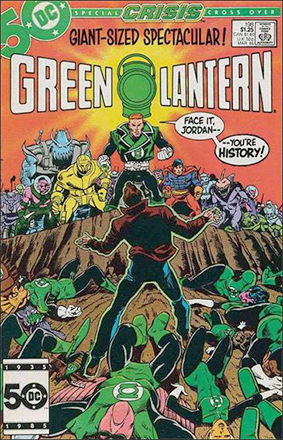 "1" Hal Jordan and Guy Gardner team up to fight the Weaponers of Qward. The Green Lantern Corps attempts to stop the destruction of the Anti-Monitor's birthplace, since it would give him more power. Script by Steve Englehart, pencils by Joe Staton, inks by Bruce Patterson.